Recently, my family and I were invited to a friend's house; she prepared a delicious dinner for our family and hers. After dinner, she announced that she made salted cereal treats. They were such a delicious surprise that everyone, toddlers and adults, enjoyed! I was thinking about treats for the holiday season and for entertaining. I'm always searching for recipes that are quick, easy, and delicious. It's the recipe trifecta! It's an added bonus when adult and kids request recipes. Did you grow up eating cereal treats? 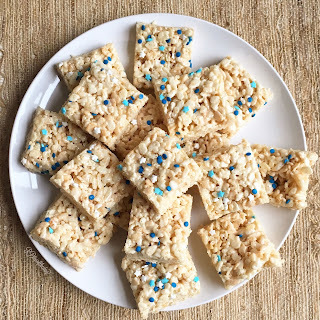 They're the marshmallow covered cereal bars. I was inspired to create a "grown-up" version of this dessert. Salty and sweet desserts are very popular. Salt helps balance the sweetness of the marshmallow. Also, I've been on a browned butter kick recently, so I browned the butter for these. They turned out super tasty! If you're unfamiliar with browned butter, don't worry. Keep reading, and I'll explain. Sprinkles (optional) - I used navy, light blue, and white stars. Measure all ingredients. Have them prepared and ready to go. This process is called "mis en place." It's super helpful for this recipe because you need every ready to go. Prepare an 8 x 13 baking pan by lining the bottom with waxed paper. Spray the pan with nonstick cooking spray. I used a canola oil spray. Start by placing 1 stick (8 Tablespoons) butter into a large pot. Heat on medium heat. Stir the butter consistently until the color turns to a caramel color, and it smells nutty. Add salt. Then, add all the mini marshmallows. Stir marshmallows until they are melted and smooth. Turn off heat. Add cereal treats, and stir until coated. Pour the cereal treats into your lined 8 x 13 inch pan. Let the cereal treats set until cool for 15 minutes. Turn treats out onto a cutting board. Spray a knife with cooking spray, which helps cut the sticky treats more easily. Cut into 16 pieces. I really enjoyed making . . . and eating these browned butter treats. The browned butter gives a caramelized, nutty almost smoky taste, which offsets the sweetness of the treats. The salt helps balance the sweetness. To me, these taste like a salted caramel cereal treat. This dessert is quick, easy and tasty! It's everything I want in a dessert. I hope you enjoy this dessert and share it with your friends! For more recipes, encouragement, and tips for healthy eating, follow me on Pinterest, Instagram, and Twitter.